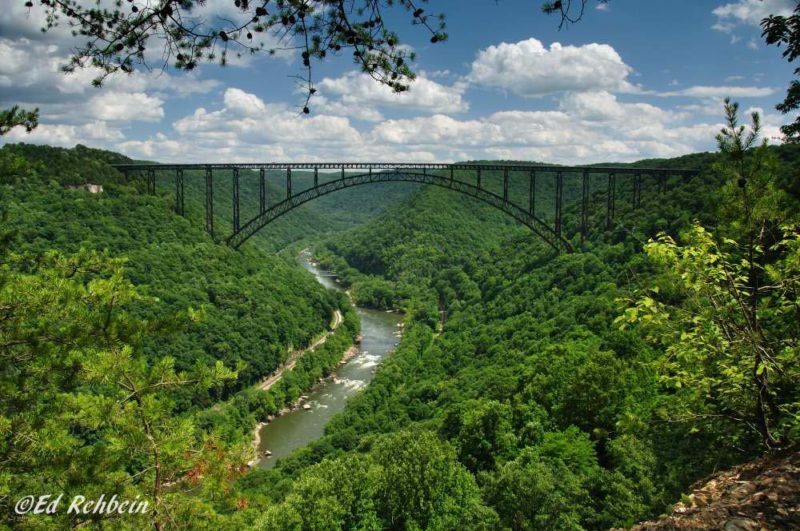 Traffic on the scenic route beneath the New River Gorge Bridge will be limited through July. Photo courtesy Ed Rehbein. Visitors to New River Gorge National River who wish to travel the winding scenic route beneath the New River Gorge Bridge will be required to suffer a detour through mid-July. Part of Fayette Station Road near Fayetteville, West Virginia, will be closed while the route is repaired, repaved, and widened, according to Julena Campbell, a spokesperson for the National Park Service. Visitors may still drive, walk, or bike to the New River and most other resources in that section, though access will be restricted to the route nearest the Canyon Rim Visitor Center. “During this time the portion of Fayette Station Road on the south side of the river will be closed to all traffic, including vehicles, pedestrians, and bicyclists,” Campbell said. Hunsaker emphasized that construction should not limit access, but visitors should expect delays, and two-way traffic will be permitted on the narrow winding route, which is now usually a one-way route. “The entire portion of the road on the north side of the river will remain open during the project and a temporary two-way traffic pattern will be established,” she said. “Visitors to the area should expect delays and be alert for new two-way traffic on this narrow and winding road. Peak hours of congestion at Fayette Station usually occur between 2–6 p.m. daily, and boaters and other park visitors are encouraged to plan accordingly. All users are reminded to follow posted speed limits and drive defensively as many visitors are used to the one-way nature of the road. Campbell said hikers touring the trail system on the south wall of the gorge should also expect to be routed away from the construction area. “In addition to the road closure, the Kaymoor Trailhead near the bottom of Fayette Station Road will be closed to hikers,” she said. Hikers on the Fayetteville Trail and other area trails are also advised that there is no outlet to Fayette Station Road during this project and should plan accordingly. For more information about the road construction project should consult the W.Va. Division of Transportation website.